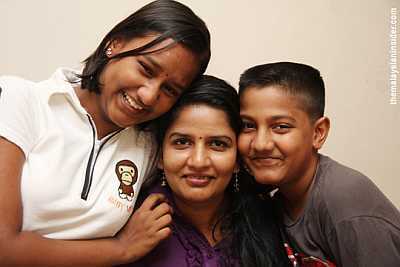 IPOH: Kindergarten teacher M. Indira Gandhi, who is seeking to quash her three children’s conversion to Islam, has applied for the case to be moved to the Federal Court or heard in full by the High Court. Her lawyer M. Kulasegaran made the application before High Court assistant registrar Helmi Ghani in his chambers yesterday. Kulasegaran told reporters that Justice Zainal Adzam Abdul Ghani would decide on May 6 if he would order a full hearing into the case or refer it to the apex court. Indira Gandhi is seeking to nullify her children’s conversion to Islam by their father without her consent on April 3, 2009. Despite an order made by a separate High Court here last May for her estranged husband Mohd Ridzuan Abdullah to return their youngest child, Prasana Diksa, mother and child have yet to be reunited. The case, in which Indira Gandhi has been also granted custody of her two elder children – Tevi Darsiny, 13, and Karan Dinish, 12 – is pending appeal by Mohd Ridzuan, who has obtained interim custody of the children from the Syariah High Court here. Met at the High Court, Indira Gandhi, 36, said she continued to live with the pain of not being able to see and hold Prasana. The child turns three on April 8 and the last time the mother saw her daughter was just before the little girl’s second birthday. “It’s a reminder of how much I have missed out on my baby’s life,” she said. 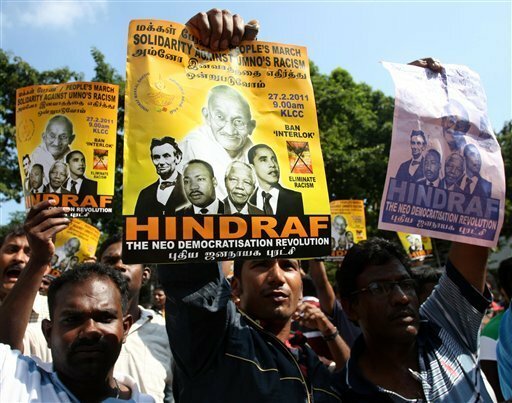 Hindraf the Hindu Human Rights activist movement made headlines when their gathering in Kula Lumpur was dispersed with police brutality years ago. With the ongoing Civil Unrest all over Middle East and North Africa in Islamic countries, Malaysia might turn out to be the next stage setting for the serial drama of suppression of human rights. Hindu ethnic minorities have been long denied educational and employment opportunities and the Islamization under Mahathir reached sinister proportions when thousands of Hindu temples were razed down by the regime. That was a turning point in Malaysian politics when Indians irrespective of even religious differences, with even Christians joining under the umbrella of HINDRAF- the Malaysian Hindu Rights action forum. The disenchantment with Malaysia’s Islamistaion and discrimination was so wide spread among Indian origin Malaysians that the Hindraf even upset the last election results unseating long entrenched Community leaders who were branded as traitors to their cause and interests. Now then came the news of refusal of permission for a protest meeting at a time when regimes are convulsing with popular unrest in all the Muslim nations. None of the regimes have been able to suppress without losing credibility and even losing hold of control, the latest being Libya and Bahrain. Unlike the Arab street protesters who have no dearth for torch bearers and cheer leaders among the media and opinion makers, the plight and news of Hindu minorities reeling under the oppression of Islamisation in Bangladesh, Pakistan and Malaysia are selectively blacked out and under reported, if not distorted as communalists. The anti-Hinduism has thus assumed the same connotation as anti Semitism. The protest is about introduction of a novel that spits out venomous racial slurs with terms such as ‘pariah’ meaning an ‘Outcaste’ referring the Tamil Hindus which the Hindu community seriously feels offensive. The Malaysian Indian Congress too had seriously objected to the Curriculum including a blatantly offensive racist novel as literature for students. 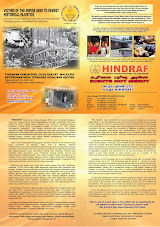 The Hindraf web site had published pictures of the crackdown while demonstrators attempted to proceed toward Twin towers of PETRONAS buildings, to hold a Protest meet against the ongoing discrimination and suppression of Islamist Malaysia. Kg. Buah Pala: DAP Penang DCM II Indian mandore repeating like a parrot the very same double storey house story. But towkay CM denies land to all 28 Tamil schools & all Hindu cemeteries and Hindu temples all in one go. Where is the change? Why is DAP playing the very same towkay politics played by the immediate past Gerakan Government? This towkay DAP does not need 50 years to rule Penang or to get to Putrajaya first to do this. All he needs is just 5 seconds to sign a policy paper as the Penang Chief Minister has 100% powers on all land issues by virtue of Section 76 of the National Land Code. If he is unsure he should ask MB Khalid Ibrahim of Selangor who granted land to 40 Malay settlers within 3 months of promising during the Hulu Selangor by-election. DAP and PKR in Selangor and also PAS in Kedah are all playing the very same a la MIC & UMNO politics by using their Indian mandores in hatching and rehatching the very same point. If at all the nutty Professor must know that a good point does not become better when he keeps repeating it. Like UMNO, PKR, DAP & PAS keep the Indian poor minds busy by making especially by Tamil media statements of land here and land for Hindu temples, cemeteries and Tamil schools there but refuse to make public the tittles there to. PKR, DAP & PAS don’t like the Indian to move on beyond this Tamil school, Hindu temple and Hindu cemetery problem, to thereafter start demanding equalness to the Malay muslims local and overseas Yayasan scholarships state tenders and projects, top jobs in these P.R. state governments, Municipal Council Presidents, Directors and top state civil service jobs, top state, GLC jobs etc. At least undo the injustices meted out by the UMNO government to the Indians in these 3 states in over the last 50 years. So where is the change? PKR, DAP and PAS are no different from the racist UMNO regime. All what they want is the Indian votes. And Not and Never their problems however serious or critical it may HRP’s Project 15/38 is the only way forward.